Help shape the long-term rehabilitation of Stony Creek following the large warehouse fire in West Footscray last year. You've told us, we've listened, what's next? Through community events and online activities in February and March, you shared your stories about why you love Stony Creek and what you enjoy doing there. You also shared your ideas, aspirations and priorities for rehabilitating the creek. Your local insights, values and ideas are being used to develop a community-focused rehabilitation plan to help restore and enhance the condition of the creek and its surrounding environment. You can provide feedback on the draft plan which will be released mid-year. Make sure you're 'following' this page to receive news updates and to be kept informed of other opportunities to have your say. In the meantime, take a look at what people said and a summary of what we heard. Read a summary of what people said, or browse people's comments on the storyboard and interactive map. Find out how local community members prioritised your ideas and how these will be used to develop the rehabilitation plan. We'll make sure that the actions in the Stony Creek Rehabilitation Plan align with our new Healthy Waterways Strategy, which was published in December 2018. The strategy builds on the great work already achieved, and provides the strategic direction for the management of rivers, creeks, wetlands, floodplains and estuaries in the Port Phillip and Westernport region. The program for the Maribyrnong catchment will be an important reference for the actions and projects to be undertaken along Stony Creek. We understand that the community has provided feedback during the consultation process for the proposed Cruickshank Park and McNish Reserve Masterplan. We will make sure that the rehabilitation actions for Stony Creek align with what you've already told Maribyrnong City Council. For updates on the Cruickshank Park Masterplan and information about other open space planning in the area, visit Maribyrnong City Council's website. The Environment Protection Authority (EPA) helps businesses and industry understand their obligations and access guidance on preventative measures they can implement to manage environmental impacts. 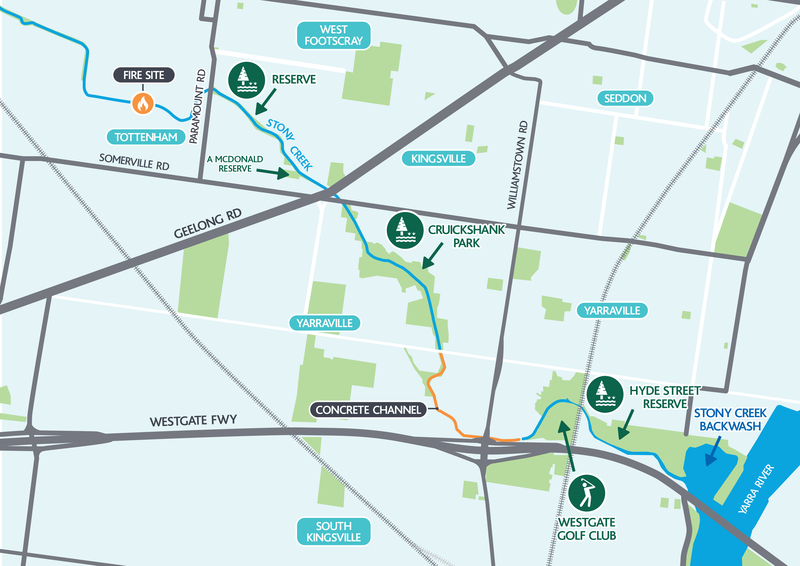 Melbourne Water protects and improves greater Melbourne’s major water resources on behalf of the community. We do this through the projects and services we deliver on a day-to-day basis, as well as through our information and education resources and support and funding of community water initiatives. Do you live upstream of this project area? Get involved in our 'Reimagining Stony Creek at Sunshine Hospital' project. Melbourne Water and our partner agencies, Maribyrnong City Council, the Environment Protection Authority (EPA) and other agencies, are committed to restoring and enhancing Stony Creek. As custodians of Melbourne’s waterways, we understand how valued Stony Creek is to the local community, and how passionate people are about its recovery and rehabilitation - which is why we're involving the community to create a plan to support the long-term rehabilitation of Stony Creek. Feedback received online and from community events will be used to help develop the Stony Creek Rehabilitation Plan. We will work with our partner agencies to outline clear objectives, refine the identified actions and projects for the rehabilitation plan, including defined roles, responsibilities and accountabilities. We will also ensure that the rehabilitation actions align with relevant agency plans including Melbourne Water’s Healthy Waterways Strategy and Maribyrnong City Council’s Cruickshank Park Masterplan. A draft plan will be developed and publicly released to seek feedback from the community to ensure it aligns with the local community’s expectations and values. After incorporating feedback on the draft plan, the final Stony Creek Rehabilitation Plan will be published in mid-2019, ready for implementation. While this planning is underway, we're continuing to implement on-ground recovery works together with our partner agencies. Follow this page to be kept informed of project news and future opportunities to have your say. Share stories and photos about what you value about Stony Creek. We’ll be seeking your ideas, aspirations and desired outcomes for rehabilitation via our interactive map. You can participate online or come and see us in person at one of our 'pop up' information stands. Sunday 17 and Sunday 24 March. We'll be using your ideas and aspirations captured from our map and online tools in this workshop to identify a set of desired outcomes, key priorities and actions for the rehabilitation plan. We'll take on board all of the feedback received online and from community events to create the rehabilitation plan. We will work closely with Maribyrnong City Council, EPA Victoria and other agencies to outline clear objectives, refine the identified actions and projects for the rehabilitation plan, including defined roles, responsibilities and accountabilities. A draft plan will be made available to gather feedback, ensuring it aligns with community expectations, values and aspirations. After incorporating community feedback on the draft plan, the final Stony Creek Rehabilitation Plan will be published, ready for implementation. This document provides a catchment view of all the activities to be implemented as part of our new Healthy Waterways Strategy. More information on the on-ground recovery works can be found on our Stony Creek Recovery web page. For questions or concerns about the current recovery works, visit the Maribyrnong City Council web page. We're keen to know how well you've been informed and involved on this project. Take our 5 minute survey to provide your feedback.